The Level 5 HSK exam includes writing, reading, and listening sections. Pinyin does not accompany the characters in the test. Students may take the test online or they may opt for the handwritten version. Prior to beginning to study for this exam, you should have an understanding of the rules and test format of the Level 5 HSK exam; these are described in the next paragraph. Test takers who are able to pass the HSK (Level V) can read Chinese newspapers and magazines, enjoy Chinese films and plays, and may experience some difficulty in delivering a lengthy Chinese speech. Test takers can talk with native speakers in Chinese fluently and somewhat effectively, will acquire 2500 Chinese characters and master HSK Level 5 related grammar. 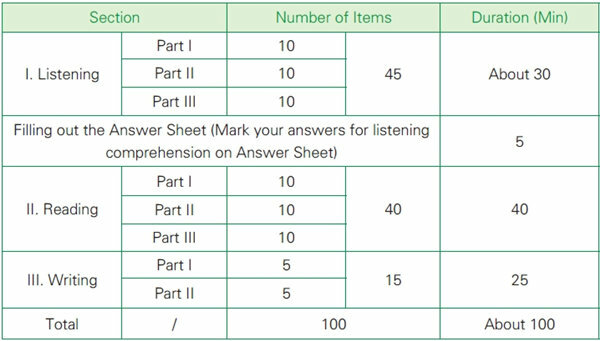 HSK (Level V) test is made up of listening comprehension, reading comprehension and writing sections and contains 100 items. The test will last for 125 minutes in total (including 5 minutes in which test takers fill in personal information). Part I contains 20 items. Test takers will listen to each item only once. Each item is a dialogue of two sentences between two persons, and another person will raise a question based on the dialogue. 4 options are given on the test paper and test takers should select the right answer based on what he/she has heard. Part II contains 25 items. Test takers will listen to each item only once. In this part, each item is a dialogue of 4 to 5 sentences or a paragraph, and one or several questions will be raised based on the dialogue or paragraph. For each item, 4 options are given on the test paper and test takers should select the right answer based on what he/she has heard. Part I contains 15 items. Several passages are given, each with several blanks. For each blank, a Chinese word or a sentence is missing and 4 options are given. Test takers should select the right answer. takers should select the option corresponding with the content of the passage. Part III contains 20 items. Several passages are given, each with several questions. Test takers should select the right answer to each question from 4 options. Part I contains 8 items. For each item, several Chinese words are given and test takers is required to write a sentence with these words. Part II contains 2 items. For the first item, several Chinese words are given and test takers is required to use these words to write a short passage of about 80 words; for the second item, a picture is given and test takers is required to write a short passage of about 80 words based on the picture. 1. Use the HSK book and online mock test. The online mock test is excellent for reviewing the writing portion of the test (书写, in which you must form a sentence by putting words in the correct order) and the reading section (阅读). This mock exam is available on the official website. Additionally, you may use some of the HSK books that include several mock exams; for instance, you may use the New HSK Mock Tests for Level 5. Make sure you purchase official HSK books, which much more accurately align with the actual HSK test. Additionally, you can locate the entire test in mp3 form at the Confucius Institute’s webpage. 2. Learn to type or write characters by hand. For many students, the writing portion is the most difficult part of the exam. There are two required essays (80 characters long). One essay is based on an image and the other is based on a word list. It is not too difficult to write 80 characters; however, the catch is you need to understand how to write characters that correspond with the image and the word list. 3. Read and listen to a variety of material. First, you should intently listen to the HSK mock papers daily and study the sentences that you have difficulty with. Listen several times until you understand the meaning of the audio. Whenever you can, you should also listen to Chinesepod or Chinese radio. Another good habit to get into is to watch a variety of Chinese TV and movies that you enjoy, such as《金婚》,《北京爱情故事》etc. After watching them, listen to them the next time to improve your comprehension of spoken Chinese. Reading is the other skill you need to hone; you should read a variety of blogs, articles, newspapers, etc. online. For the writing and speaking topics, you need to become well informed about current issues. Try to read at least one book each month or read the news every day. Choose a pace and frequency that you can handle, and create a routine of reading that works with your schedule. At this level, you should be reading the Graded Chinese Reader 1 and Graded Chinese Reader 2 to develop your reading skills. As you study, make sure to be consistent and focus on your vocabulary as well to boost your overall knowledge of Chinese. 4. Increase your reading speed. Speed can be a crucial component in whether you pass the exam or not. If you don’t have enough time, you won’t be able to do your best. In the reading portion of the exam, there are 45 questions and you will only have 40 minutes to complete them. This means you have to answer questions at a rate that is faster than one per minute. In the third section of the reading portion, there will be approximately five articles that each have three to five questions. You may find it helpful to read the first question, then begin reading the article and continue reading until you find the answer to the first question, and then read the next question and continue this process. There will be only 40 minutes for you to complete the writing portion of the exam, so you must take approximately 5 to 10 minutes for the first section (which has eight sentences) and then approximately 15 to 17 minutes for each essay. Keep track of the time so you can pace yourself! Additionally, you need to remember that although there will be five minutes following the listening portion of the exam to answer the questions, you will not be given additional time after the reading portion of the exam. While completing the reading portion, be sure to answer the questions as you go along.